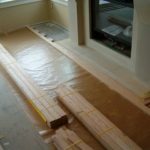 You have already read about unfinished hardwood flooring in one of the articles on this website. Now you know all the advantages and disadvantages of picking a certain type of wood. Now it’s time to learn about one of the most valuable experiences that you can have by installing this type of floor with the glue down method and making a good career for yourself. Many floor installers like to work with unfinished hardwood flooring, because it is easy to hide their installation errors. Almost all of a floor installer’s mistakes can be removed with the following process – cutting the top layer of the wood. This job is for sanding installers. Sometimes with the help of sanding they can even hide even incorrect floor leveling, if it only has small mistakes. You already know that, despite the fact that unfinished hardwood flooring comes in two forms – solid wood and engineered, their characteristics are very different. However, they can be installed the same way – nail down, glue down or floating method. Due to the fact that builders more commonly install cement floor in the houses in recent years, the need for installation of hardwood using the glue down method has increased considerably. The glue down technique requires certain knowledge and skills, otherwise you will ruin the material – material that is already installed and material that had not yet set. That is why many floor installers don’t like to take projects that require glue down installation. Among floor installers you can not often find ones who work with glue down projects as a master. The fact that many customers prefer to install pre-finished hardwood flooring, which means that all work must be done cleanly, and the professional should not mess with glueing the front surface of the floor that is difficult to do. When it comes to installing unfinished hardwood flooring with glue down techniques, it’s the most wonderful moment when you can train and gain invaluable experience. Even if you leave a large part of glue on the surface of hardwood, a machine that sands the floor quickly and easily fixes those mistakes. If you want to improve not only your skills but also your wages, I highly recommend you master the glue down method to perfection. It does not matter what country or city you live in, prices on the installation of the glue down method everywhere much higher than other methods of installation. The most suitable projects, where you could get experience and improve the skill set by the glue down is the projects with unfinished hardwood flooring. Try to learn from them as much as you can. Experienced floor installers always work purely, the same way as with unfinished flooring and with prefinished. They argue that the good floor installer must have a habit to work always purely. 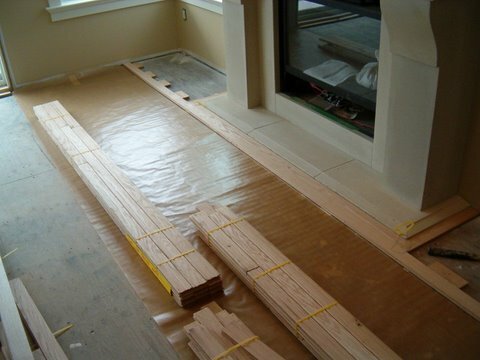 If you do not have this habit, you will not raise the speed of installation by the glue down method, when you install prefinished hardwood flooring. Therefore, working with each new project, try to leave glue as little as possible on the part of the floor you already installed. Every time work cleaner than on the previous project. Working with unfinished hardwood flooring – this is a great opportunity to start your career and beginner floor installer can benefit from it.